# of Pages: 289 p.
Jack lives with his parents in a normal town, where he excels in football and other sports as well as academics. For Jack life comes pretty easy, which is why he can never understand why his parents never want him to shine like he knows he can. They are always encouraging him to let others win and try to blend in more. One night after a particularly great football performance, he notices a strange man following him. When he tells his parents his dad immediately takes him as far away as he can while explaining that they are not his real parents. He does not tell him why they have lied to him all these years or who his real parents are before they are ambushed and Jack is forced to flee for his life. As Jack tries to figure out why he is special and what his task is, he comes across many different types of characters. Some are more helpful than others at helping him find his destiny. He soon learns that he was sent back from the future in order to stop the world from making terrible environmental mistakes that humans will pay for dearly in the future. Those who come to help him tell him he must find the firestorm in order to preserve the earth from the evils of humans, but he has no idea what firestorm is and no matter how hard he tries there is always someone trying to hurt him. The idea of a young man being chosen for something great without him knowing it has been used many times in young adult books, but the idea of Jack having to save the world from humans destroying it through different types of pollution is a new twist. Obviously, it’s hard to understand how he can possibly save the world from all humans, but it is obvious that this is one of a trilogy so he will have many battles to fight in order to save the earth. There is a lot of action and fighting sequences that fans of action movies will enjoy. Most of the story is well-described, but the ending happens pretty fast so readers will have to read very closely in order to find out how everything is resolved for the time being. The ending is a little unsatisfying, but part of that is probably due to the fact that there are two more in the series. Silver is living in her family home, Tanglewreck, with her evil aunt, Mrs. Rockabye when the book begins. Silver’s family was killed when she was young and now she is forced to watch as Mrs. Rockabye takes over her house in every way. Silver must scrounge for food and do her chores constantly. When a mysterious man comes to inquire about a clock, Silver hears him promise her aunt a lot of money if she can locate it and turn it over to him. 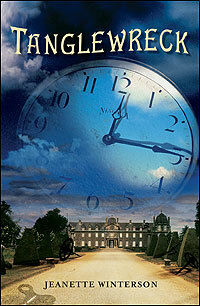 Unfortunately, no one knows where the magical Timekeeper clock is and because of that time has begun to fall apart. Sometimes time stand still and other times it speeds up. Most disturbing of all is when there are time warps and people and things disappear and go into another time and place. Silver must go on a journey to find out where the Timekeeper is and what she is meant to do with it. There are two main characters who want the clock for two different reasons and it is unclear to Silver at times which is the lesser of two evils. Silver meets a lot of friends along the way and learns more about how she needs to fix the issues with time the world is having before it is too late. This book was entertaining, but some of the explanations of how time can be manipulated might get a little confusing for younger readers. The ending seemed a little abrupt after 400 pages. Readers who have been along for the leisurely story up until now will either be happy for the quick resolution or feel jilted out of a proper ending.